Brainlab invites you to visit Booth #1819 at the 29th NASS Annual Meeting to discover the latest image-guided spine surgery solutions.In line with this year’s theme “Putting Patient and Surgeon Safety First”, Brainlab is proud to showcase our Spine Navigation application; enabling accuracy in pedicle screw placement and reduced X-Ray exposure for both patients and surgical teams.Experience the latest in CT imaging with Airo® Mobile Intraoperative CT, a system designed to function inside existing O.R. suites. 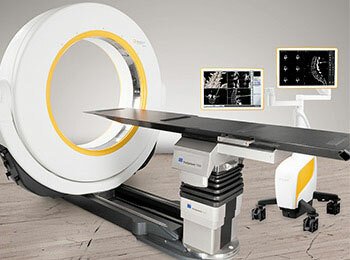 Airo is ideal for spine, trauma and cranial procedures, making it a highly versatile intraoperative imaging system. Communication between Airo and Curve™ Information Guided Surgery makes connection to Brainlab image guided surgery systems swift, image transfer automatic, and the merging of pre- and intraoperative scans a snap.For spinal planning, Brainlab Elements software applications bring instant access to a suite of planning solutions that work seamlessly together, delivering capability without complexity.Improving patient care in spinal surgery goes beyond the tools in the O.R. Quentry®, the global physician-to-physician network from Brainlab, provides a secure environment for collaboration, consultation and patient referrals. For more information on Brainlab products featured at NASS 2014, visit brainlab.com/NASS2014.